My preliminary graph (above) just had a line, but I also want the area under the line to be shaded, and slightly transparent so you can see the grid lines behind it. Therefore I added a 'band' graph from the value 0, to the line. The default colors are ~OK, but I liked the colors that Kiefer had used, therefore I set up an attribute table to map certain colors to certain graphs. I specified group= to turn colors on in the plots, and the attrid and dattrmap told the graphs which colors to use. The original graph plotted plain numbers along the left axis, and explained in the title that the values represented "(percent)". In my graph, I add '%' to the values (such as '2%') and therefore they need no explanation in the title. I make the background of the graphs a much lighter gray, which makes the colored area graphs show up more. I put a little more info in the footnote, indicating exactly when the data snapshot was taken. Also, when you click the footnote, it takes you directly to the data download page. I added a 'dot' marker to the latest value, so it's more evident that's what the dashed refline represents. And, I add HTML mouse-over text, so you can mouse over the lines, and see the exact monthly values. (Click the image of the graph above, to see the interactive version with mouse-over text). Below is a screen-capture example showing the mouse-over. Now it's your turn - help me interpret these graphs! Do these numbers mean there are more jobs available now than in the past? Feel free to add your views/opinions/interpretations in the comments section. I honestly don't know how to interpret that information! But, as a minor point, I kept getting confused on whether the label was for the graph above or below the text. Since the label is physically closer to the graph above it, I kept reading it that way until I noticed I had extra labels at the top. Just a thought. 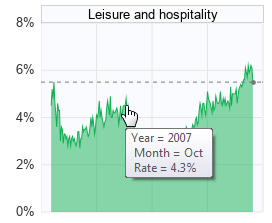 Hmm... maybe I need to add more white-space between the graphs (I used 6 pixels). Or maybe I need to use a slightly darker background for the graphs (so the white-space between them has more contrast). Sounds like you've got good insight into graphs - I might give those ideas a try! At 2008, there was a financial storm . 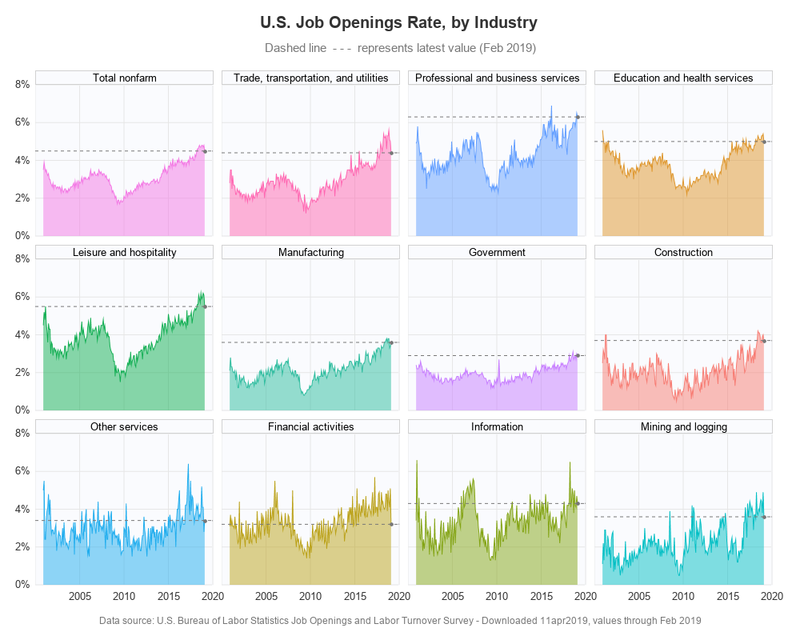 The job openings rate of 2008 in the United States is the lowest in history. We now don't have financial storm, so the job openings rate is not the lowest. Hahaha, that maybe too strained. I did the exact same when I first saw the example graph. I'd lean toward putting the label at the bottom.